Chasingthe70s: YEA our wheels still roll. YEA our wheels still roll. 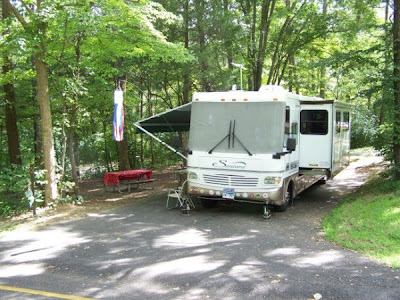 Today was moving day, finally we left Raccoon Valley RV Park. It was sad in a way to leave all the friends we have made there, and to leave so quickly after Gary and Karen arrived, but two and a half months in one spot was about two months too long for me. We left the park around noon, saying our good-byes always takes longer than we plan, but hey, we are in no hurry. We drove about 17 miles north on I-75 and took exit 134. 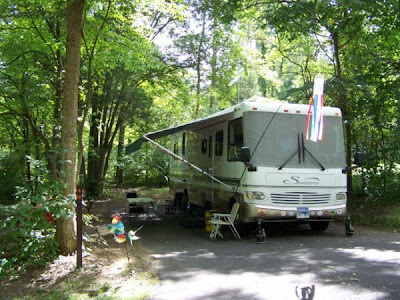 We took hwy 63 for about 40 miles until it ran into US hwy 25 E. Turned north for about 2 miles before turning onto HWY 58 into VA, and then the 4-5 miles to the Camp Ground here in the Cumberland Gap National Historical Park. It took a lot longer to fill the fresh water tank than normal, mainly because I didn't open the valve to fill the tank. DUH... I new we had sat too long. We have the park almost to ourselves, we only saw a few campers here as we picked out a site. he camphosts told us it was full Friday night. I backed the rig into site B-18, a corner site that we have never been able to get before because it always had someone in it. After we got the jacks down and the slide out Marcia bailed out on me. She used some lame excuse, "I have to run to the store" to keep from setting everything up. I guess it is a good trade seeing how she is going to get FOOD. I managed to get things set up for the cookout tonight, dad, Scott, Corey, Jennifer, and Miss Jaelynn will be coming over, and we will be grilling some of those thick juicy steaks we bought at Sams yesterday. Jennifer is bringing the desert, (I love her cheese cakes), and I hope everyone else brings their appetite. I finished getting things set up with time to spare so I thought doing the blog would give me a chance to sit in the AC and rest up a bit. This moving and doing a cookout in the same day is too stressful for me to do very often. 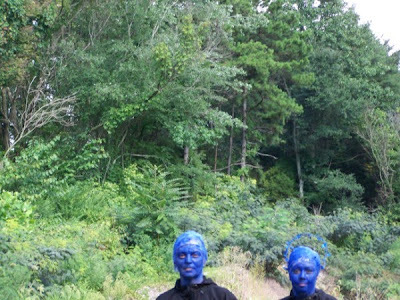 I did get a glimpse of a couple of the "blue women" before we left the Knoxville area, and I will be going back to for further investigations. I am amazed at how close I was able to get to them to take that picture, but then I was hiding pretty good, and spending time in the mountains hunting helped me sneak up without them noticing me. At least they didn't act like they saw me. And the picture came out clear, unlike the distorted one I took a few days ago. That picture was close to Knoxville TN. I had always thought Jay Carter was joking when he talked about being abducted and the things the blue women did to him. I'm thinking he might have been telling the truth. Sparrowfoot Camp Ground Clinton MO.